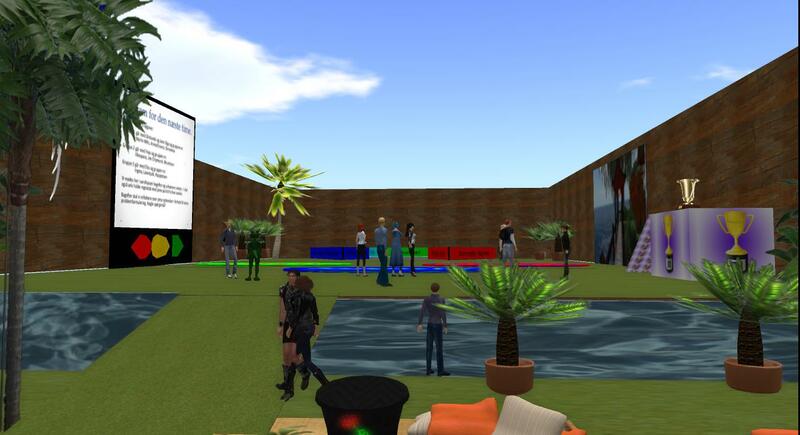 Late January my in-world colleague, Inge Qunhua attended a research seminar at University of Worcester’s island in SL where she had the opportunity to share some of our experiences from the MIL11 class (Danish PD students from the Master’s Program on ICT and Learning). Based on this, another in-world educator, Sheila Yoshikava of the University of Sheffield became interested in learning more, and on Friday, February 17th Inge had arranged for a meeting, where Sheila’s students from Educational Informatics could come see the MIL11 students’ sandboxes and hear about their experiences. mouritzen, Anina, me, Inge & dirkovski (in front) meeting in Team B’s sandbox. Three MIL11 students were able to participate and we meet for a short briefing in Team B’s sandbox. Inge explained how the visitors would be interested in hearing about the teams’ designs of their sandboxes. 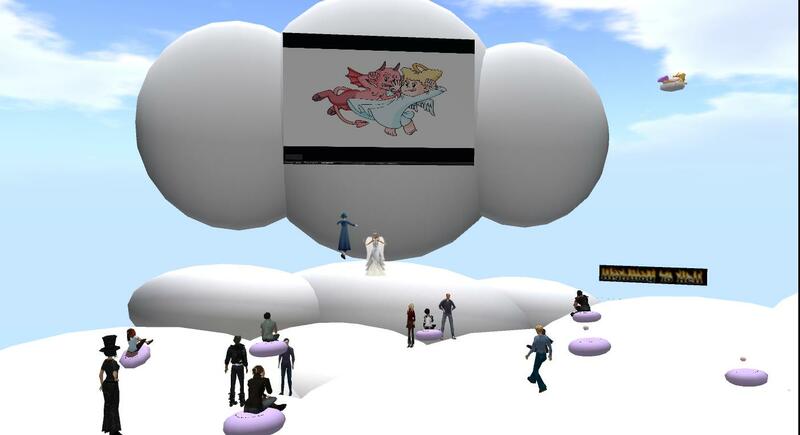 Sheila is the owner of Infolit iSchool Island in SL, and she writes about her in-world experiences on Adventures of Yoshikawa. RL Sheila (Webber) is faculty member in the Information School, University of Sheffield, UK and Director of the Centre for Information Literacy Research, and she also maintains a blog on general Information Literacy. 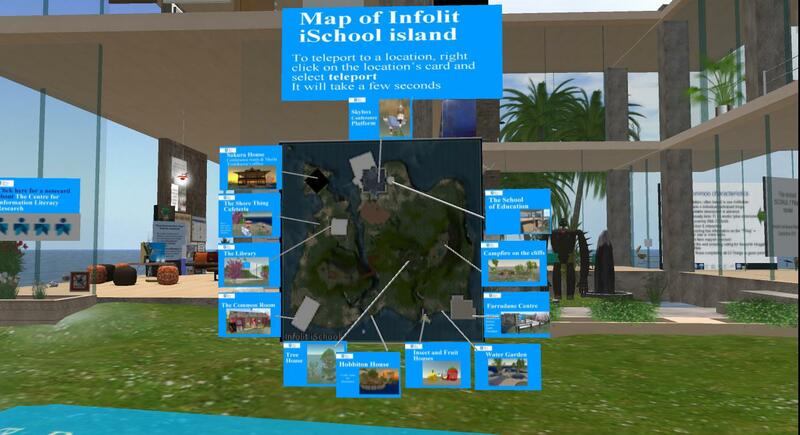 Infolit iSchool Island – welcome area. We started in Team B’s sandbox, where dirkovski explained about the team’s work and how the they had tried to design for different learning styles by using different modalities in both design of the place and in different learning activities. Sheffield Inf6011 students gathering in Team B’s sandbox. Read more about Team B’s sandbox here. Team B’s dirkovski took the Sheffield students on a tour and explained about the team’s design. Next stop was team D’s sandbox, and here mouritzen explained how the team had wanted to make use of some of the SL affordances that enable design not-possible-in-real life and how they had tried to focus on immersion and presence in their design of the sandbox and the activities. Read more about Team D’s sandbox here. Team D’s mouritzen explained the team’s design in their Matrix inspired cave. Final stop was Team E’s sandbox, and here Anina started out by explaining how they had wanted to explore how SL could be used to make physics lessons more fun and engaging. Read more about Team E’s sandbox here. Team E’s Anina explaining the team’s design. 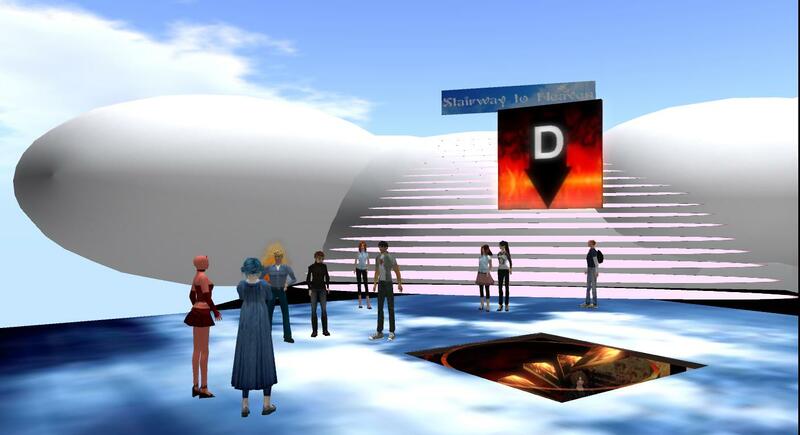 As it turned out, the Sheffield students were very new to SL – some of them had only been in-world for a couple of hours, and I think the visit was a bit overwhelming. 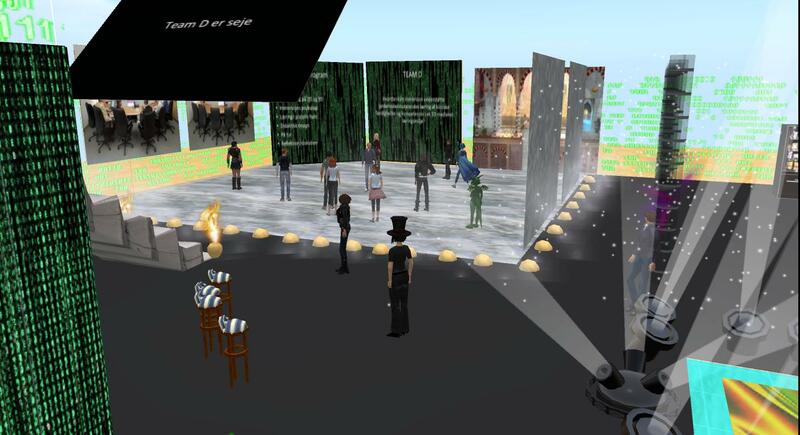 However, judging from the feedback we received, the Sheffield students were encouraged by seeing what can be done/designed after a relatively short period in SL – when you’re a newbie building/designing often seems like an unattainable goal. Furthermore, bringing students together across countries and cultures really has a lot of potential and it is definitely something Inge and I would like to practice more in the future. As experienced in-world educators Inge and I are used to sharing our knowledge with other educators form around the world in different in-world groups and communities, and it would be just wonderful to be able to extend this type of knowledge sharing so that it included our students. 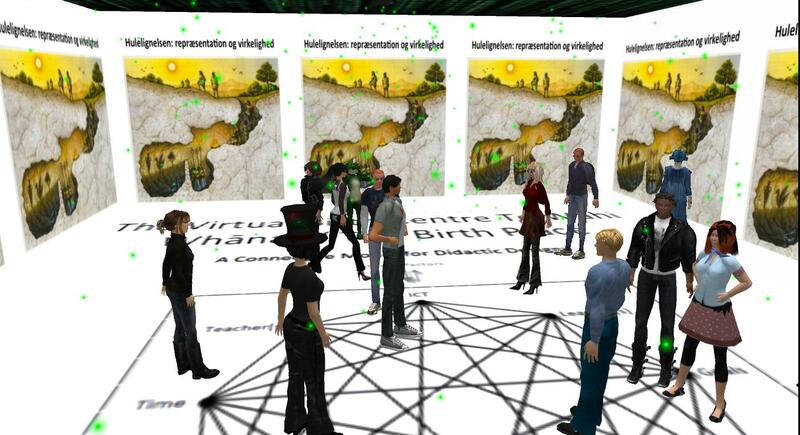 A major argument for using SL in education, it that it is a fairly open technology (at least compared to traditional LMSs/VLEs), and having visitors like this was just one small step in the right direction leading to more inclusion of “the world outside” (albeit 3D mediated) in the university setting. 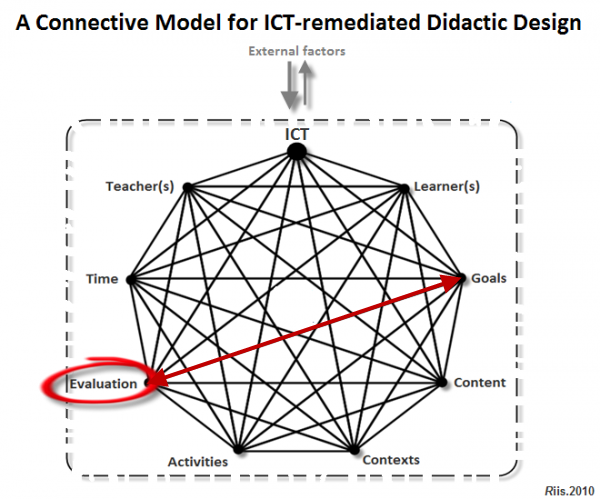 As previously described I’ll be using my Connective Model for ICT-remediated Didactic Design for the general analysis of my PhD data. A first step in this process is working with the 9 basic elements in the model and in this post I’ll focus on some preliminary work I’ve done on the element of Evaluation as depicted in the model below. Evaluation means arriving at a value judgment on the basis of measures (qualitative or quantitative) considered to be valid and reliable, which compare the actual results of a Didactic Design with its anticipated results. The element of Evaluation is to some degree connected to all the other elements, but according to the working definition there is a particular strong connection to the element of Goals, since this is where we can derive the criteria for evaluating the results. When dealing with Didactic Design there will always be a least two major perspectives from which we can look upon certain elements, namely the teaching perspective and the learning perspective, and in what follows I’ll present some initial reflections on the particular part of evaluation that concerns the evaluation of learning outcome/results. To do so I want to dwell a bit on the concept of Literacy, which I consider to be vital when discussing the purpose and goals of especially formal education. In its most narrow sense literacy refers to the ability to read and write, but used as a more general concept literacy refers to being knowledgeable or educated within a particular field. In an interesting UNESCO report on the plurality of literacy and the concept’s connection to the right to education as stated in article 26 of The Universal Declaration of Human Rights of 1948, the evolving notion of literacy is discussed and defined: “Literacy is the ability to identify, understand, interpret, create, communicate and compute, using printed and written materials associated with varying contexts. Literacy involves a continuum of learning in enabling individuals to achieve their goals, to develop their knowledge and potential, and to participate fully in their community and wider society.” (UNESCO.2004:13). 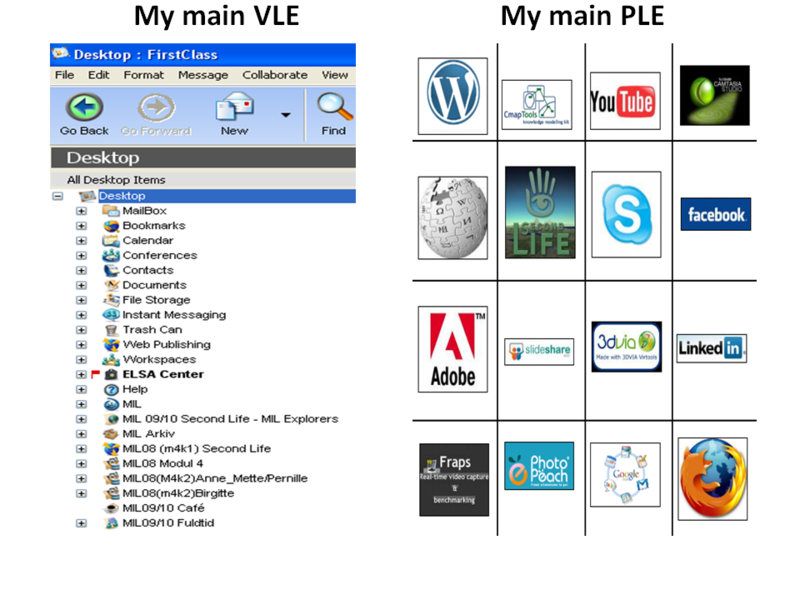 Above all the plurality of literacy refers to the many fields in which literacy can be employed – specific literacies denominated by prefixes such as information, computer or media to name a few.